When you take your dog with you in the car on a trip, you want to make sure they’re comfortable while they’re away from their usual dog bed at home. A car dog bed is not only great for using in the car but also once you get to your destination. You can use a travel dog bed to set up at a friend’s house or while you’re camping. 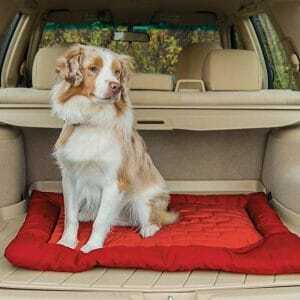 Whether you want to take your dog with you for day trips or overnight stays, you’ll be happy you have a car dog bed. If you travel a lot with your pet, you’re going to want a dog bed that’s not only comfortable but durable enough to last for awhile. Dogs need a place of comfort because it can be hard on a dog to travel just like it can for a human – especially long distances. 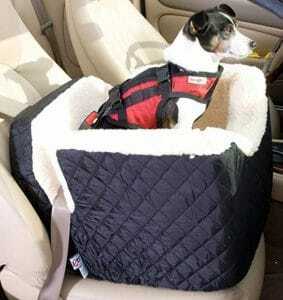 If you have a small dog, the Snoozer Lookout Car Seat is a bed that’s a perfect fit for traveling. Click here for more details & availability of colors. It comes with a connection strap that connects the seat belt to the harness. 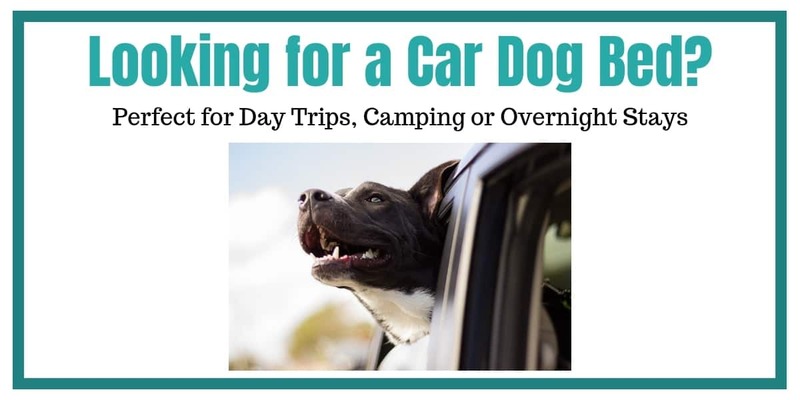 This is important because you want your dog to be safe as you travel. The Snoozer Lookout dog car seat also offers the advantage that your dog can see better out the window while they’re sitting in the car. This helps to avoid travel sickness. The interior is made of a sherpa lining simulating lamb’s wool and the bed comes in a variety of colors. The cover is removable and safe for washing as well as for placing in the dryer on low heat. It’s safe for dogs that weigh up to twenty-five pounds and the interior is large enough for your dog to sit or lie down in. Dogs that weigh more than twenty-five pounds need a larger car dog bed. For larger dogs, the Kurgo Loft Wander Travel Dog Bed is great. Because of its size, it can be used for both large and small dogs. It comes in a medium or large size. Medium unrolled size is 27 x 36 x 2 inches. Large unrolled size is 36 x 48 x 3 inches. The colors available are either red or brown. Because it can be rolled up like a sleeping bag, it’s easy to keep stored when it’s not in use. The bottom is waterproof and non-slip, so your pet won’t be sliding around in the car during the trip. Being waterproof you get the advantage of being able to use it on wet grass when camping. And if you want to take it with you in the car but only use it at your destination then it’s an advantage that you can roll it up and secure it with its own built-in handle for easy transport. 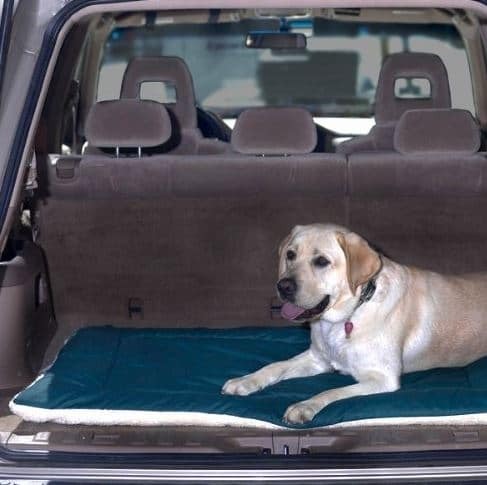 The top on this travel car dog bed is also waterproof which makes it ideal for taking camping or elsewhere in the outdoors. Another good bed for both large and small dogs is the 2-in-1 All Season Dog Bed by Pet Dreams. This bed is made of cotton on one side and Sherpa on the other. This lets you use cotton for your dog in hotter months and Sherpa for when it’s cooler. It keeps your dog comfortable. It’s perfect for everyday use as well as in the car and comes in a variety of sizes and colors. The bed itself is washable, so you don’t have to remove any covers or liners. They are guaranteed to never bunch up after washing! This dog bed can also be used as a crate pad or kennel mat. You can even use this dog bed inside to protect your sofa. Because both sides are fabric there are lots of ways to use it. The largest size accommodates dogs up to 110 pounds. There are six different sizes available. For dogs that need a little bit of extra space, you’ll love the K&H Travel SUV Pet Bed. This bed comes in a small or large size. Small size is 24 x 36 inches. Large size is 30 x 48 inches. This car dog bed fits in the trunk of many SUVs and minivans. It has a water resistant bolster that gives extra comfort to your dog. You get a non-slip bottom so the bed remains where you place it and help keep your dog more secure in the car. You can purchase it in either tan or gray colors. It’s great for travel in the car and can easily be used at your destination too. ⇒ Looking for an Extra Large Dog Bed? See here. ⇒ Could your dog benefit from using a Dog Ramp? Read about ramps here. ⇒ Is your dog getting bored? See the best dog toys here. This entry was posted in Comfort & Mobility on August 9, 2018 by Didi.